beccamonstr and her suggestion of legwarmers. I have a Jeep Wrangler (very little between you and the outside on the floor of the Jeep) and while my legs get cold my feet are just fine. I think legwarmers would do the trick–I hate hot feet so I usually wear knee highs or just deal with cold calves. I can already think of a few ideas for making up a pattern for them. In other words, it’s a great excuse to do a little designing. They’ll use at least 2 balls of the Koigu, which was a big requirement for me. I don’t want to make 2 projects out of the same exact shade of Koigu. I just know I’ll end up not finishing the second project, and that’d be such a waste of the yarn. I can see using some of the yarn I pictured to actually make the legwarmers. Pixie’s bandana suggestion. VERY cute idea! Mary Beth’s suggestion to do a turtleneck similar to Annie’s. I like this idea A LOT but not for the colors I have right now. I will keep this one in mind though as I visit the LYSs. I see a T ranging from blacks at the bottom into greens and maybe a touch of pink. This will definitely mean I’ll have to collect some yarn though. Dharma’a suggestion to do the Foxy Shawl. How pretty! I love the gradation going longways (similar to the pooling scarf without the anxiety of forcing handdyed to pool!). 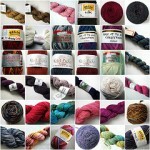 While you’re looking at the Foxy Shawl be sure to visit the rest of Foxy’s site. 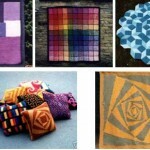 There are tons of Koigu patterns there! So what does beccamonstr win? Well, I’ve emailed her* asking for a little direction in terms of the colors she likes. Koigu is too nice not to be used, so I want to make sure it’s something that’ll suit her. Once we chat and I do a little stashdiving/shopping I’ll be sure to show you all too. Thanks everyone for participating. I got some great ideas and inspiration, as well as the chance to meet some new commenters. I do still plan on making some of the double hanks into socks. One thing I’ve heard or read though is that Koigu socks tend to stretch out. Those of you who have made Koigu socks–do you find this to be true? Either way, I’d like to hear about it (including the gauge you used). I suspect some of it may be due to a looser gauge, but I’d like to know now so I can do this yarn right! *I’m slightly concerned that my email might get filtered out as spam since it has the words “contest” and “winner” in it. 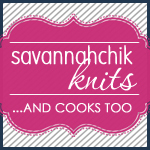 If you didn’t get my email please email me at savannahchik AT yahoo. Thanks! My koigu socks were a bit loose at first but I actually wash and dry them (shame on me) and they got much better and softer too! I made a pair of the Feather and Fan socks from Socks x3 in a relatively loose gauge (6.5-7 spi on US 2) – the pattern pulls in quite a bit, but I haven’t had trouble with them stretching at all. What I have had trouble with is differential fading – the intensity of the color is now quite different in each sock. Grrr . . . I love the legwarmer idea! I joined a Legwarmer-knitalong (it is still going on…) and made a pair last month. I wear them all of the time – mostly under my bootcut pants. I may knit another quickie pair to match some other outfits! Knit tightly and apply a round in the dryer if they stretch. Legwarmers? Good idea! But I must confess, I have never in my life up to now worn legwarmers! Yes, Koigu socks tend to stretch out when you wear them. 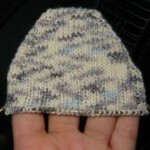 Next koigu socks i make will be made smaller in circumference and with a smaller needles. I made Lucy Neatby’s Fiesta Feet in Koigu. Maybe it’s the stranding and the slip stitch patterns, or just the miniscule needles used, but these have never stretched appreciably. They’ve also held up spectacularly — mine are at least five years old and still going strong. Oooh, fun! 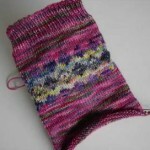 I love legwarmers…I love Koigu…I love this idea! Great idea! Will you share the pattern? I’m working on Koigu socks on a size 00 needle to make them nice and snug. My other pair I knit on a 0, with about 7.5 spi (I’m a loose knitter) and they have definitely stretched. Not to the point that they’re not wearable, but it’s noticeable. This new pair I’m getting about 8.5 spi and they’re much snugger, so if they stretch a little, they’ll still fit. I would go down a needle size if I were you. There’s a good legwarmer pattern in the book, Weekend Knits. I think they’re shown in Morehouse Merino which is similar to Koigu.